Our staff of 28 includes moms, dads, college students, newlyweds, teachers, professionals – even a biomechanist – and we all love to run. Some of us are recreational runners and some are competitive racers. We come in all sizes, shapes and ages. Our job is to find the shoe that fits your foot and your needs. We utilize high speed video to assist in our personalized fitting process. We’ll even work with you to develop a training system. But don’t worry. While we’ve got loads of experience, you won’t find lots of attitude. What you will see is our passion for helping customers and our desire to earn your trust. 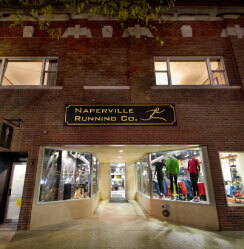 It’s this knowledge and enthusiasm that’s resulted in awards for the top running store in the United States and Naperville Small Business of the Year. So run or walk on in. We can’t wait to fit your feet. We collect "gently used" athletic shoes for Share Your Soles. You can bring in up to 5 pair of athletic shoes, in wearable condition, and we will make sure they are given to Share Your Soles to distribute throughout the world to those in need of foot covering. Please no dress shoes or shoes that are worn out. Running shoes with several hundred miles, but still look fine, are what they are looking for.